Mystic Dunes Golf Club | GolfTrip.com - Golf Tips, Vacations, Packages, Destinations and more! There is nothing mystic or supernatural about the Mystic Dunes Golf Club in Orlando. Although, it would only be truthful to say there is nothing ordinary human about it. There is an air of divine-like beauty in its layout. It seems as if the gods themselves have set foot on earth to create a beautiful mash-up of some of the best courses the world in the Carolinas, the British Isles, and the world-renowned classic the Augusta National. This is one golf vacation destination where there is not a need to summon the good spirits. The Mystic Dunes Golf Club, a Gary Koch design, does not hold a 4.5 star-rating from Golf Digest for no reason. 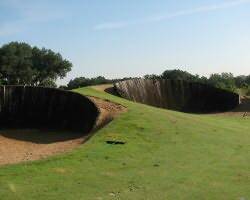 It is a whooping 7,012-yards, par 71 layout. Four other sets of tees make the course playable for golfers of varied skill levels should the championship tees prove too overwhelming. And then there are very distinct nines – a glimpse of the Carolinas to open the game with – native wetlands and marsh areas, old growth cypresses and oaks – and travel to the British Isles – links-style, bunker-laden back nine – to close it with. If that is not enough a golf trip surprise delight, one need not wait long or think hard to find the Augusta National flavor to it. Paired with the 80-feet elevation changes, the greens here which are of prime kind and perfect maintenance are almost exactly that of the famed Georgia golf course. That’s primera classe greens carpeting rolling terrain bordered by even more rolling sand dunes and natural vegetation. Nowhere else is there a golf vacation creation that brings together golf world’s bests. There is no need for good spirits at the Mystic Dunes Golf Club, the best are already here.